Fox has post-strike air dates for new episodes of House, Bones and other prime-time series, but no specifics yet on how many there'll be. The network also officially confirmed that 24 won't return until January 2009 in the interests of again running 24 episodes consecutively. House -- new episodes begin on April 28th. The time slot is new, too. 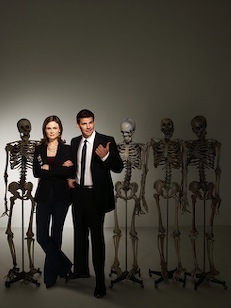 It'll be Mondays at 8 p.m.
Bones -- Back again with newbies on April 14th. Back To You --It resumes on Feb. 26th. 'Til Death -- Born again on March 25th. Hell's Kitchen -- Heats up anew on April 1st. Fox also has moved up the air date of the new Julianna Margulies series Canterbury's Law from April 14th to March 10th. A trio of other scripted freshman series also will premiere in March. Sequentially, they are Unhitched (March 2nd), New Amsterdam (March 4th) and The Return of Jezebel James (March 14th).